Wear Teal for TN: Thank you! 7th International Trigeminal Neuralgia Awareness Day on October 7th, 2019! 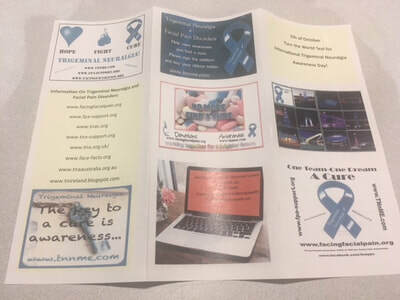 So much more awareness for Trigeminal Neuralgia and Facial Pain Disorders. Please Help! Please help us find a CURE by spreading awareness, education and funding for research! 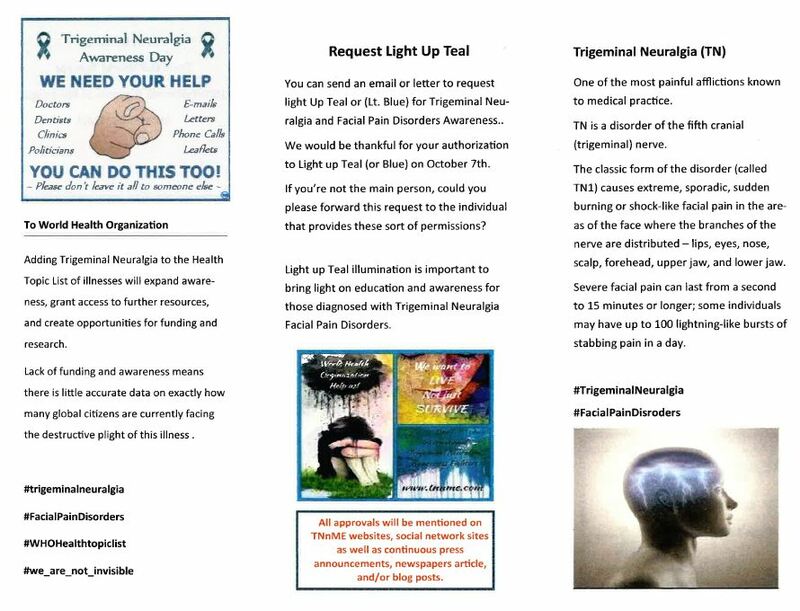 We are celebrating the 7th International Trigeminal Neuralgia Awareness Day on October 7th, 2019! We would be thankful for your authorization to “Light up Teal” (or Blue) on October 7th, 2019. If you’re not the main person to make this kind of authorization could you, please forward this request to the individual that provides this sort of permissions? This year we would like to shine a little brighter teal with the Light Up Teal illumination initiative by asking not only your structure to light up teal but if you can pay it forward and suggest another iconic building and public spaces to join us. 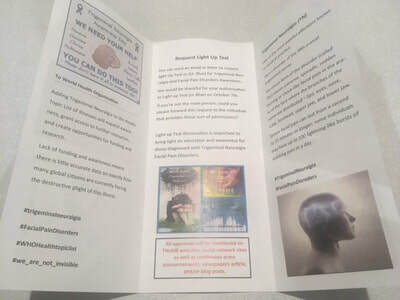 The 2019 Light up Teal illumination initiative is to bring light and awareness to the World Health Organization by asking them to please add Trigeminal Neuralgia to their “Health Topic List” of illnesses which will expand awareness, grant access to further resources, and create opportunities for funding research for Trigeminal Neuralgia and Facial Pain Disorders. Our goal this year is to have over 200 World Landmarks, international bridges, buildings, and structures to "Light up Teal" for October 7th, 2019. We're flexible with dates. All approvals will be mentioned on TNnME websites, social network sites as well as continuous press announcements, newspapers article, and/or blog posts. We will make sure to send any coverage to help keep everyone posted and this year we would like your help and letting us know your social media sites, so we can give public thank you and mentions. 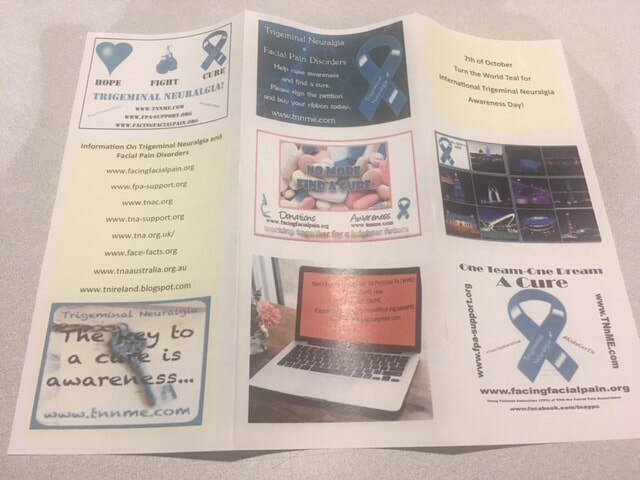 All mentions of approvals will be listed on 2019 “Light up Teal" on TNnME web-site. See below for details and please let us know should there be anything we could do to get your authorization and support. Date of Special Lighting: Sunday Oct 07, 2019 (We're flexible with dates as we had approvals from last year October 1st thru October 13th in 2018! Definition Trigeminal neuralgia (TN) is a very painful disorder of the portion of the fifth cranial nerve (trigeminal nerve) that supplies sensation to the face. It is characterized by recurrent electric shock-like (paroxysmal) pains in one or more branches of the trigeminal nerve (maxillary, mandibular, and/or ophthalmic branches), each supplying a different portion of the face. Severe facial pain can last from a second to 15 minutes or longer; some individuals may have up to 100 lightning-like bursts of stabbing pain in a day. Although remissions are common, trigeminal neuralgia usually is a long-term condition. It can be triggered by such stimuli as heat or cold, windy hitting the face, chewing, yawning, or talking. Because the sudden, sharp pain causes the individual to wince, the condition is known as tic Douloureux or painful twitch. What is Facial Pain Disorders? What is the Battle Scars of TN/FP? How to Donate to the Facial Pain Research Foundation? Why is Trigeminal Neuralgia classified at G50?